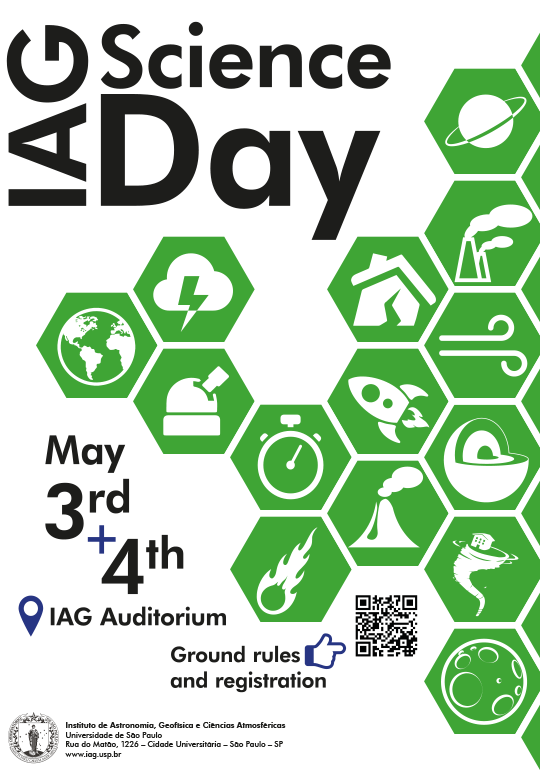 We are pleased to invite you all to the first "IAG Science Day” on May 3rd and 4th, 2016. This event will be an opportunity for all IAG members to present a concise summary of their research to all the other members of our institute. Picture yourself at an important conference in your field. You meet a very famous, Nobel-prize winning scientist in the conference, who asks: “Tell me about your work”. You know you just have a few minutes to answer. What would you say? - Be concise and to the point! It is advisable to practice your talks and make sure that you can say what you want to say within 4 minutes. But you can also deliver an impromptu speech and just keep talking until your time is up. The idea is to present and discuss our research projects in a constructive and relaxed environment. - More instructions will follow soon. - All participants that so request will receive a participation certificate. 3) André C. G. Kowalski - Identificação de fraturas transmissivas em maciços cristalinos. 10) Sergio Ibarra - Que, como e quanta poluição do ar gera a nossa cidade? 2) Leonardo A. dos Santos - O Sol é uma estrela comum? 1) Juan Carlos Bastos Pineda - Can we measure the dark matter haloes of galaxies using rotation curves? 5) Oscar Andres Lazcano Patroni - Estudo numérico e de campo da interferometria sísmica de ruídos ambientais (ANSI - ambient-noise seismic interferometry) visando à investigação rasa. 1) Paulo Lago - Modelagem da estrutura tridimensional de Nebulosas Planetárias. 8) Henrique Marques Reggiani - High-Precision differential abundances in extremely metal-poor stars. 10) Victor Sacek - Como o manto esculpe a superfície da Terra? 13) Rafael Christ de Castro Lopes - Effects of modified gravity in the spherical collapse. 4) Marcelo Assumpção - Por que há tremores de terra no Brasil? 11) Julia Carolina R. Vera - Determinação do Plano de Falha e Tamanho da Ruptura do Sismo de Santa Cruz, Bolívia, 5.2 Mw, mediante localização relativa das réplicas. 2) Rachel Albrecht - What makes a thunderstorm?